It’s been six weeks since I handed over the first 59 pages of my novel-in-progress to the big NYC agent and two weeks since I received their reply. They weren’t chomping at the bit to see the next chapters, but they weren’t closing the door all the way, either. In fact, they gave me an invaluable critique and encouraged me to send them more if I continued to work on the manuscript for stronger narrative arc. The question is, of course, what have I written sense then? …which I refuse to feel bad or guilty about. During those six weeks “off” I finished up Summer Arts Camp, taught a week-long residential memoir course, moved back home, sorted/packed/unpacked/sold/donated ALL of my worldly possessions (no exaggeration there), waitressed over 80 hours in a 3-week period, spent over $1700 on Airstream necessities and dealt with putting said necessities to work, spent countless hours helping Dad with ongoing Airstream improvements–from gravel to shower curtains, secured a series of monthly critiques I will give six adult writers who work with me via distance, negotiated my first book contract with the help of my agent, and finally, eventually, put my foot down with all of it and said STOP. The insanity is over. I now only waitress 2-3 shifts per week, I’m readily available for and enjoying work with my adult writers, the Airstream projects happen a few times a week (rather than every day), and I’ve stopped spending money on improvements (because there really isn’t any more money to spend). This opened up a lot of time, which went immediately to reading. After a long break from writing, it is countless hours of reading that bring me back to the writer’s page most effectively. Currently being read: A Gate at the Stairs by Lorrie Moore, One Hundred and One Days by Asne Seierstad, Dust to Dust by Benjamin Busch, and the Sunday New York Times (every week). Putting my foot down and shaping a new, more sustainable schedule for myself also came at a time when I had 5 days off–for the first time since June. What did I do other than haul gravel and dig water bars? I read. And read and read and read some more. Between reading I walked the dog. And wouldn’t you know, on my way to work today I heard the first sentence of a new short story. As soon as I walked into the pub, I grabbed an order form from my apron and scribbled down the sentence. Then another. And another. And in a few more beats I knew my narrator was a teenage girl living in Yancey County and the opening scene of the story was on the school bus. 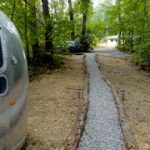 I may or may not write that story immediately–but I’ve got the first few lines that I can believe in tacked to my bulletin board in the Airstream right now. And most importantly, I’ve found the pulse of new words again, and taken the time to put them onto the page. It’s like an aura before a seizure, perhaps, and if all I learned about my creative process these last three years was any indication then I know what comes next: writing. Hours of it. The real deal. The thing I love most. However slow and steady, it sure feels good to be back. Very cool! Sometimes our creative minds need a break to refill the well, and it looks like yours has done that. I also appreciated your book list, which I looked up on Amazon. Dust to Dust sounds like the perfect Christmas book for my oldest son. He was part of the first wave of Marines into Iraq at the beginning of the Gulf war and still struggles with nightmares over the carnage in which he found himself immersed there. But he also had a childhood similar to that of the author. Glad to hear that you are still teaching memoir. It was after your first class that words broke free in me. I'm attending my 3rd retreat in Imnaha soon. Would love to see you there again someday!